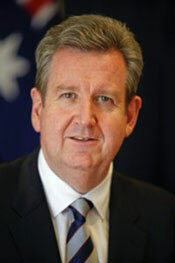 Barry O’Farrell was sworn in as the 43rd Premier of NSW on 28 March 2011. Barry was born in Melbourne. His father’s army career saw the family move to Darwin where Barry completed his schooling. In 1980 he graduated from the Australian National University with a Bachelor of Arts, majoring in Australian History and Aboriginal Studies. Barry has a strong background in public policy having worked in the field at both State and Federal levels. Immediately prior to his election to Parliament he was State Director of the NSW Liberal Party.